Have you ever wished that people would comply when you ask them to call you Dr. Chuckles? Do you ever see a tiny car and want to pile in with twenty of your closest friends? When you see a balloon, do you just want to get in there and stretch it into the shape of a wiener dog? 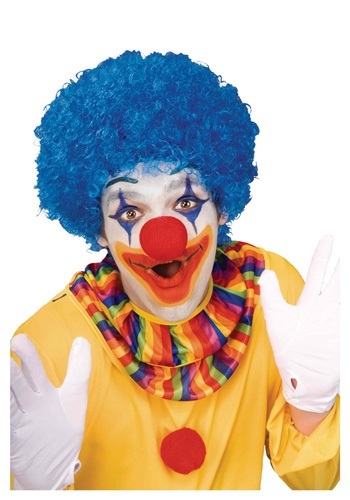 If you're craving that nose honking, big shoe wearing lifestyle, there's no better place to start than getting yourself a bright blue clown wig. You don't have to go to clown college to start clowning around. All you need is the right attitude, a red nose, and some crazy hair. Before you know it, juggling will just come naturally to you. You will feel right at home in circus tents. You might even learn how to cartwheel. You'll find you have a certain squeak to your step, as you spread giggles wherever you go. Start working on your signature chuckle, cause they're about to send in the clowns!